Ukrainian volunteer battalions, primarily made up of ultranationalists and radicals, were once Kiev's key instrument in fighting against self-defense forces in the Donbass region, but they have now turned into the main threat to the war-torn country, a German news magazine noted. 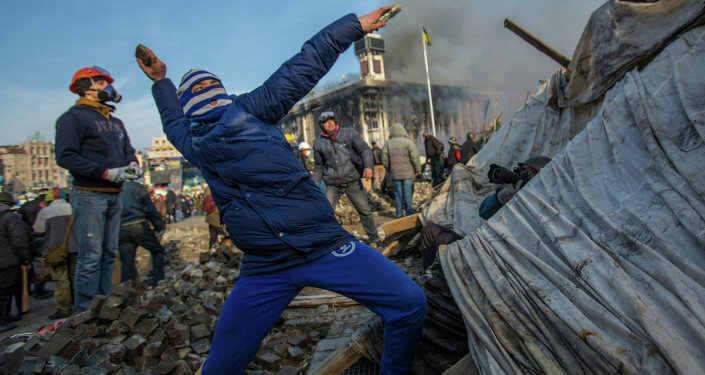 "The ultranationalists are threatening Kiev with a new Maidan, chaos and bloody violence," Focus observed in an article titled "March on Kiev: Ukrainian ultranationalists want to oust Poroshenko." The radicals have turned against their old ally Ukrainian President Petro Poroshenko, because they see him as a representative of the old system, said Stefan Meister of the German Council on Foreign Relations. The expert is convinced that the ultranationalist forces "want to get rid of the corrupt elites, aim at staging a coup and will not shy away from using violence." The groups, like the notorious Right Sector, seem to have everything they need to make this happen. "They question the monopoly of the current government on the use of force. They have created a sort of a state within a state. They are armed and dangerous. Although they used to fight against the self-defense forces in the east of the country, they are currently pushing for a confrontation with the government," Focus pointed out. This has become clear after the deadly shootout between local police and Right Sector militants in the town of Mukachevo located in southwestern Ukraine in close proximity to three European countries. The locality is some 25 miles away from Hungary, 56 miles away from Slovakia and 68 miles away from Romania. The clash, which left three people dead and 13 injured, reflects a trend and is not an isolated incident. 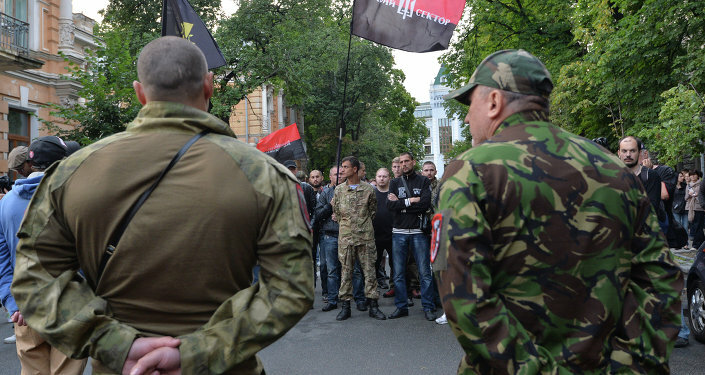 "The alliance between the ultranationalists and Kiev has long been destroyed," the news magazine stated. Meanwhile, the discontent with the current leadership will only grow. The Right Sector was formed as a coalition of nationalist and neo-Nazi organizations during the Maidan protests in Kiev at the end of 2013. In November 2014, Russia's Supreme Court blacklisted the Right Sector as an extremist organization and banned its activity in Russia. Earlier, Russia launched a criminal case against Right Sector leader Dmitry Yarosh for public incitement of terrorism. The group and other nationalist organizations played a key part in Kiev's offensive against independence supporters in eastern Ukraine and are responsible for countless atrocities committed there since April 2014. However, the government has never managed to take these groups, which enjoy a significant degree of autonomy, under full control.